We have mentioned the "looking part' and so now its onto, as those in the biz (wanker talk for wine business) say, the smelling part, or to have a good 'sniff'. 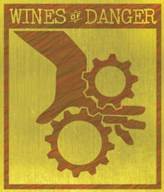 Why do we swirl the wine? When we swirl our glass of wine we are vastly expanding its surface area and volatilizing some of its aromatic particles (we are stirring up the smells). This allows oxygen to mix with the wine, releasing the esters and aldehydes (we know, poncy word alert), which yield all the smells and bouquet. In other words, swirling aerates the wine and gives you a better smell. 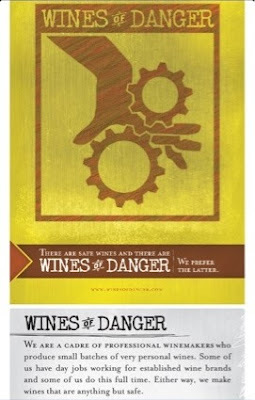 Another reason why one should swirl the wine is to give an additional look at the overall appearance. Look at the color and the "legs" that trickle down the inside of the glass once the swirling has stopped. It is sometimes felt that the more noticeable the legs, the fuller the body of the wine. Basically its about viscosity. A slower trickle relates to the thickness or viscosity of the wine which is mostly connected to the alcohol content. Ok, back to the smell bit. The spin and smell is possibly the most important part of wine tasting. The average person can smell over 2,000 and as many as 10,000 different scents, and wine has, according to some, well over 200 of its own. Now that you have swirled the wine and released the bouquet, you should smell the wine a number of times. The second and third smell usually gives you more of the subtle information than the first smell did and you don't need to stop smelling at three. What does the wine smell like? What kind of 'nose' does it have? Ponce word alert! The "nose" is a word that wine tasters use to describe the bouquet and aroma of the wine, basically what your honker is sniffing up. Pinpointing the nose of the wine helps you identify its characteristics. This is when you smell cinnamon or licorice, chocolate, vanilla, cherries or apricots. It's not that someone dropped a chocolate chip into your wine, it's that a certain group of chemicals you smell in the wine is identical to that you smell from a chocolate chip etc! The problem here is, many people want someone else to tell them what they smell. Do I smell citrus, apricot or wet horse blanket? What about black cherry, leather or tar? No one knows what you smell, only what they are smelling in their own glass. Now while generally the group should be picking up somewhat similar primary scent's it can be different on the more subtle ones, and the more you do it, the more smell memories you will have. This is where the correct stemware comes into play. It needs to be big enough to allow the wine to be swirled and yet to focus them in the glass. An adequate amount of wine is also important. And you need to not be afraid to get your nose right in there. And yes Cyrano, it should fit in a decent glass. Pick up a few clues like this and you will be poncing it up with your wanker mates in no time. The more you have done this the more likely you will be to be able to use this information to help you find more wines you like. Never forget that tasting wine is supposed to be fun. 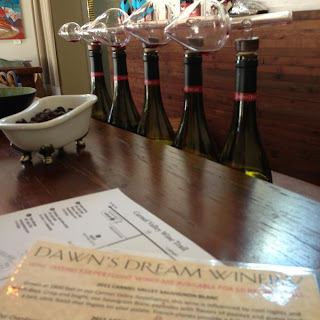 One of the wines consumed at home this week was a delightful drop from Dawn's Dream Winery in Carmel Valley. The particular bottle was ‘Nicole’ a 2011 Pinot Noir. 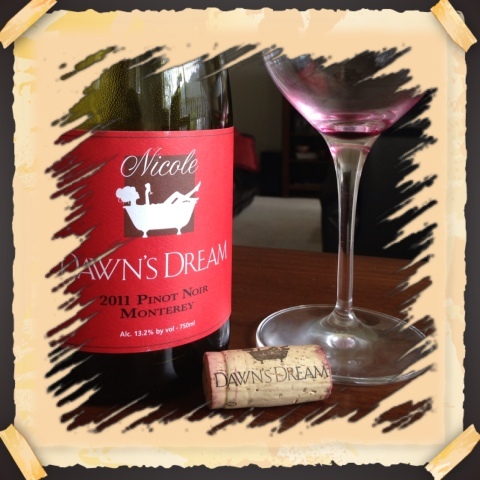 To quote the maker “Nicole’s blend combines Pinot Noir grapes from Carmel Valley and Santa Lucia Highlands. The nose has a hint of brown sugar and toasted grain and the flavors are replete with gooseberries. Medium tannins give this wine extra length on the palate and provide excellent aging potential”. One of Three daughters who’s names appear on Pinot Noir, this one just happened to be the one that stood out on the day we visited, and so was the one purchased for just such an occasion as eating at home. Having both the qualities of an SLH Pinot and also some added nuances from Carmel Valley it was easy to drink and drink and drink without tiring of the taste. A nice Pinot Noir at a reasonable price. All in all a 6+ and at $30 ***. With a passion for what she does, Dawn Galante had a dream of producing approachable wines of exceptional quality and elegance. Well the dream has become reality as the wines were definitely that. We need to go back and look more deeply into Dawn's Dream. Go by and see them at the East End in Carmel Valley and let em know we sent you! When the opportunity arises we generally take it (when wine is involved). Having to be in the Gilroy area this last week late one morning, and with no plans for the rest of the day, it just seemed like a good enough reason to go experience a couple wineries that we have not been to before. With the decision to do it out of the way next up was who is open on a Tuesday that has not been visited recently? 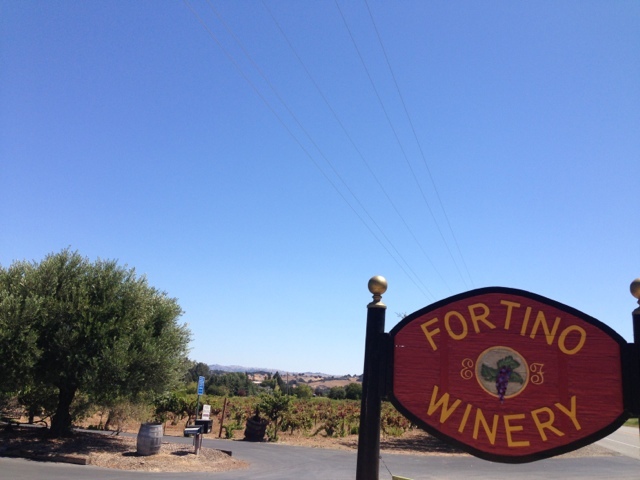 A quick search of the twitter list and first up was Fortino Winery located at 4525 Hecker Pass Rd. The sign out front is big and easy to see so you will have no problems finding the place. The winery and the vineyards have been here since the 1930s and were purchased in 1970 by Ernest and Marie Fortino. The purchase was influenced by and because the surrounding land was highly reminiscent of his hometown, Calabria, Italy. In 1995 Ernest passed on the responsibilities of running the winery to his son, Gino, and daughter, Teri. Over the years the vineyards have expanded and now stand at about 50 acres, half of which are still dry-farmed like the original plantings to produce flavor-intense grapes. 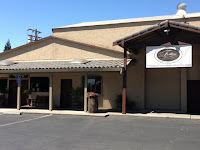 A good size comfy feeling tasting room, with a good selection of wine related items for sale make this a good stop on any wine tasting Adventure of the area. They also have a great entertainment / event / wedding areas. Between the Redwood Terrace and the Barrel Room they have it covered. With a broad spectrum of wines being poured, there is bound to one or more to please every palate. From a crisp apple nosed Riesling and a very interesting Black Muscat Blush to the Carignan (from the oldest vines, dry farmed and the one we purchased) to a Carbono as well as some more typical varieties like Cabernet Savignon and Zinfandel. If bubbly is your choice they have an Extra Dry Champagne and an Almond Champagne which seems to be quite the hit. Open 10:00am to 5:00pm Tuesday through Saturday and 11:00am to 5:00pm Sunday and Closed Monday, go by and tell em we sent you. 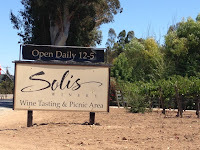 Just a little ways down the road is the Solis Winery. 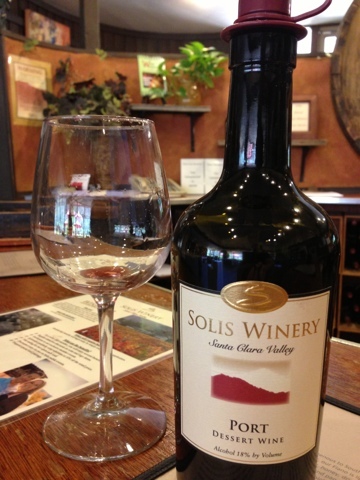 Solis winery has been a working winery since the late 1920's. 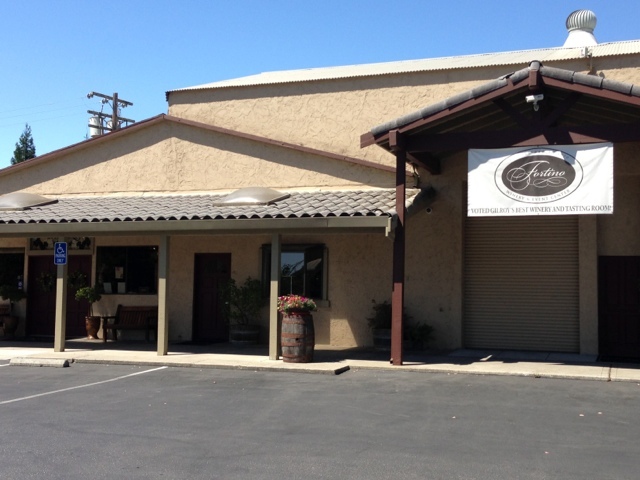 This somewhat unassuming tasting room building is hiding a secret. 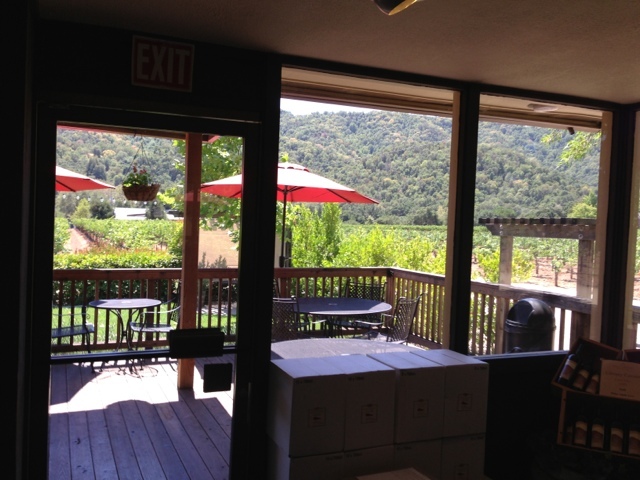 It has one of the nicest deck / view ares of almost any winery we have visited in the area. In 1980, the Vanni family purchased the land and has been running Solis Winery ever since. David and Valerie Vanni originally ran the business with their family and friends, but once they were confident enough their sons, Michael and Vic were ready, they transferred the responsibilities to them and they have done a great job as evidenced by the increasing number of awards won each year. There are many events hosted at the winery and as an example coming up on the weekend of August 31st - September 2nd the Syrah and Sausage Grill event Labor Day Weekend. Now on this weekend you head on over the the winery and purchase a bottle of Syrah for $35 for non members or $21 for club members (good reason to join their club) and along with opening the bottle and providing you glasses to drink that nice Syrah you will also get two gourmet sausage sandwiches and two pasta sides. 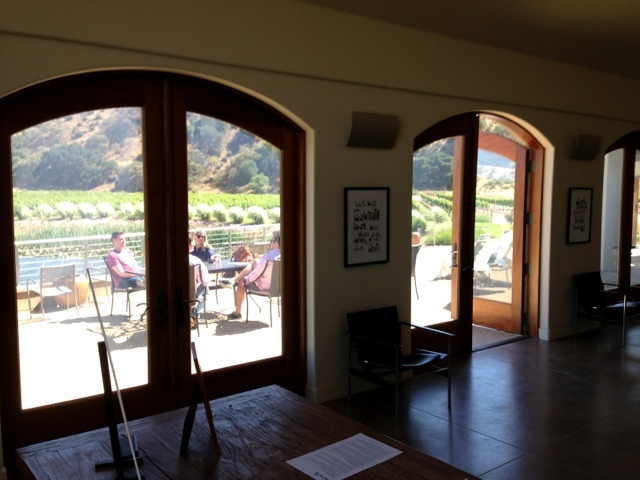 If that wasn't enough there will be live music (from 12-4:30pm) to help you enjoy the wine, food and fabulous view. Try all of the wines since your already there and find your favouite. We purchased a bottle of the 2010 Zinfandel with some BBQ in mind. Take a group and maybe buy a bottle of their lovely delicate (by port standards) port to finish the day. Go on by and have a taste and let em know we sent you! Kind of a trick headline to get you to read about what we think are five truly amazing places. The operative term here is 'what we think'! Before you all start to campaign for your favorite area (although would be interested to hear about) these are just the places we feel are the top five. You are entitled to your opinion with or without facts. Keep in mind that all of the following areas are filled with worthy places to go and that we are only exposing the tip of the proverbial iceberg. Just know that there are some really good places to go in each and everyone of these areas, and that all of these areas worth your time to go visit. Adelaide Hills; The Adelaide Hills region has really come along in recent years. Now while that may sound a little condescending its not meant to be. The Hills have in the last 5-10 years, found the magic and knowledge that allows for consistently good wine. The knowledge of the weather and the terrior and what it takes to get the best out of it. Now some years are always going to be better than others but there are some consistently fabulous wines coming from this region from a number of producers. With its summer months generally dry, with average temperatures considerably cooler than other Australian wine regions and in particular the night time temperatures being cooler than most surrounding wine regions, the wines generally take on elegant cool climate style with wines displaying great finesse and varietal intensity. Bird in Hand, Hanhdorf Hill, Shaw and Smith, The Lane, Tilbrook Estate, Golding, Protero, K1 by Geoff Hardy, Nepenthe and of course wine and dine at Penfolds Magill Estate. 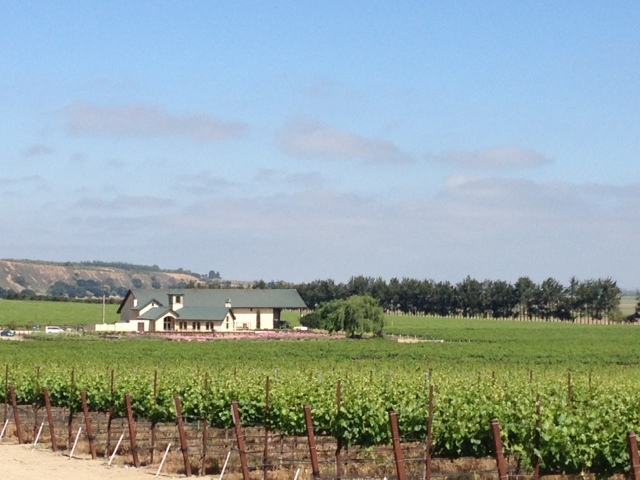 The Barossa Valley; The Barossa Valley is one the most recognized of the South Australian wine regions. Located about 70 Km north of Adelaide it has delivered outstanding vintages for over 150 years and covers an area comprising the Barossa Valley and Eden Valley. The Barossa is not just a great wine region as it still is an area full of growers of seasonal produce and makers of specialty foods. The area has one of the oldest regional food histories in Australia and is traced back to the German settlers of the 1840's. Tasting of this food is possible at not only most of the local area restaurants but also from some of the butchers, bakers and cheese makers in the area. 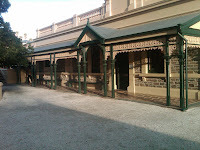 There is also what is believed to be the oldest surviving Shiraz vineyard in the world. The Barossa is not a 'new world' wine region like Chile or the United States, nor is it tied down by old rules and regulations like they have in Europe. The first settlers in the area used their European experience, and for over 150 years, their descendants have adapted it with modern technology, and knowledge to suit the soil and climate of the area. 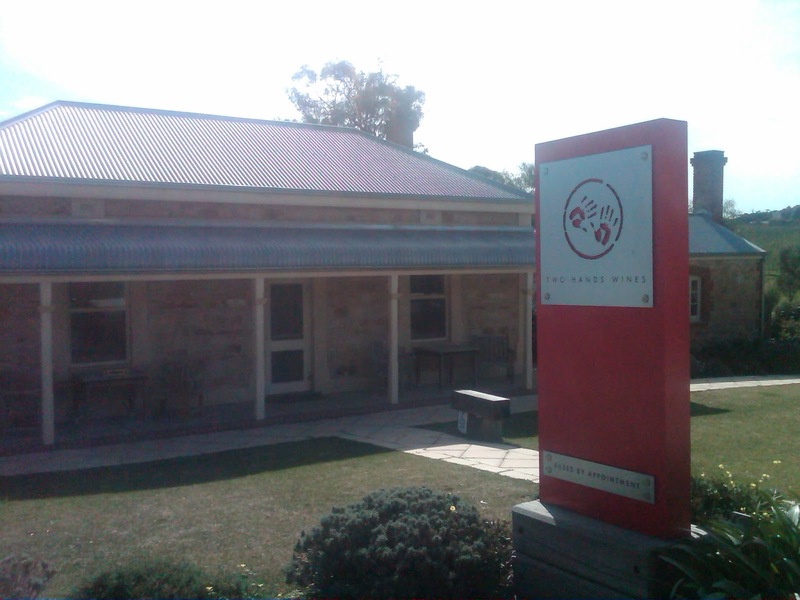 It is this heritage and these partnerships that give The Barossa such a unique identity. Clare Valley; Clare Valley shares the distinction of being one of the oldest regions having been settled in 1840. Settlers from England and Ireland, as well as more diverse places such as Poland and Silesia moved into the region during the 1840's, producing a rich heritage of architecture and villages, which remain largely intact to this day. Vineyards were planted alongside those first villages and winemaking has continued ever since. The most important white variety is Riesling, with the Clare Valley regarded as its Australian home. But that is not the entire story of wines in Clare Valley. 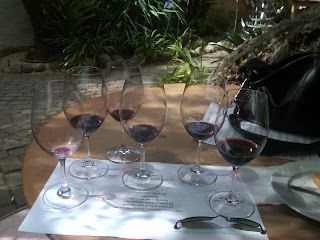 The principal red varieties are Cabernet Sauvignon and Shiraz with a little Merlot. They make a range of styles of varietal wines, reflecting different approaches to winemaking as well as the influences of the various sub-regions and micro-climates in the valleys. Many other varieties are also grown, including Chardonnay, Semillion, Sauvignon Blanc, Pinot Noir, Tempranillo and Grenache. The area has a lot to offer for those that visit here like the Riesling Trail. The Clare Valley's reputation for Riesling inspired the naming of the Riesling Trail, which is a recreational trail for walking and cycling. It runs 35 kilometres and connects the townships of Auburn, Leasingham, Watervale, Penwortham, Sevenhill, Clare and White Hut. Having spent some time walking along different sections of the trail at dusk it can be said that it is a wonderful walk. The Clare Valley has many places to eat, from bakeries and such to fine dining restaurants, as well as more than 40 wineries, and most of them have a cellar door. Drop in for a taste. Coonawarra; All wine regions like to think they are unique. The truth is mostly they are, but some are more unique than others. Some just have that certain "Je ne sais quoi". One of these regions that has this more than some of the others, is a place in the south east of South Australia, in an area called the Limestone Coast. The place with all this "Je ne sais quoi"is Coonawarra. Coonawarra is an Aboriginal word meaning "Honeysuckle". It is about 380 km southeast of Adelaide, close to the border with Victoria. Often called Australia’s “other red centre”, its premium red wines have won many awards. What makes this area so special is one of the most famous terroirs in the southern hemisphere if not the world. It is the combination of a thin layer of unique rich, red top soil (‘terra rossa’ or ‘red earth’) over an ancient limestone mantle encasing a pure, underground aquifer. Add to that a long, cool ripening season for the grapes and you have the makings of a hard won reputation as one of the world's finest wine regions, especially for red wines and, in particular, Cabernet Sauvignon and Shiraz. The cigar-shaped strip of 'terra rossa' is finite, approximately 12km long and 2km wide, and is all but taken up by vineyards. More than 24 Coonawarra wineries have cellar doors for your enjoyment. There are some area attractions that are also on the must see list if you are in the area and one of those is the Naracoorte Caves National Park. This park is South Australia's only World Heritage site. The site was officially recognized in 1994 because of the importance of the fossils in the caves. The Coonawarra area sits between two great attractions. In the north is the afore mentioned World Heritage Listed Naracoorte Caves, and to the south is Mt Gambier and the beautiful Blue Lake. Coonawarra is an area that needs to be experienced and should be on every wine lovers list of places to go. McLaren Vale; McLaren Vale is a great South Australian wine region, and sports more than 70 cellar doors. The region’s warm days and cool ocean evenings means it produces great Shiraz, Grenache, Cabernet Sauvignon and Chardonnay. They also grow and make wine from other varietals that include, Tempranillo, Viognier, Marsanne, Rousanne, Barbera and Sangiovese. It's less than forty five minutes from the city of Adelaide. The wine region is only minutes away from the stunning coastline and beaches that influence so much of the climate and lifestyle. The neighboring townships of Willunga, Aldinga, Port Noarlunga and Sellicks offer visitors some unique experience's rich in history, artisan craftsmanship and culture. Dry sunny weather helps viticulture by producing ripe grapes. The heat is cooled by breezes off the surrounding ocean, and also the 'Gully Winds' from the Hills. This makes for a smooth ripening season during which time the grapes accumulate the flavor and intensity that make the areas award winning wines. The region is home to some of Australia’s most beautiful, unspoiled beaches and the sunsets are spectacular. 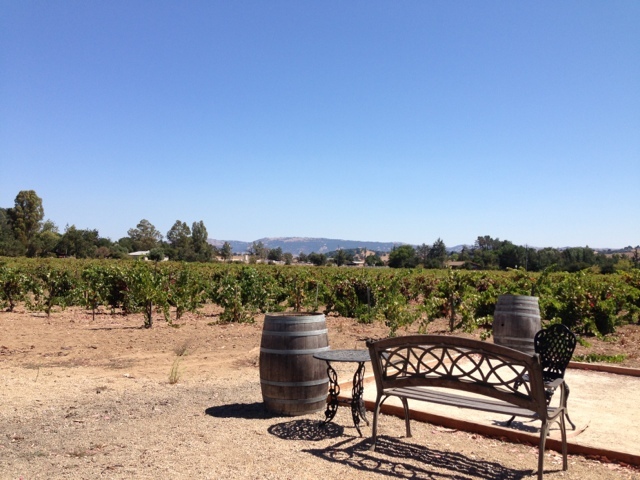 There are any number of perfect vantage spots to sit and watch one while sipping a local wine. Olivers-Taranga, D'Arenberg, Victory Hotel, Chapel Hill, Yangarra, Coriol. Although not a region, and not really fitting in with the title 5, the National Wine Center in Adelaide is also a great place to visit for a number of reasons. 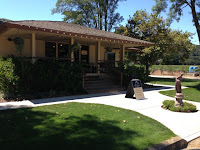 It has a great educational display of wine and vineyard information as well as tastings and events that are very very good. National Wine Center. Check em out while your in town. There are more areas of note in South Australia, but this is a great starting point for a visit to one of the best wine regions in the world. The home of, Football, Meat Pies, Kangaroos and Holden cars. Go ahead and plan your trip, get it booked, and make it as long as you can because there are ton of great things to see, wonderful people to meet, and some fantastic wine and food to be had. We say it's a 'must do'! But don't just come for the wine there are a million great adventures waiting. Check out this video for a look at just a few. As listed in the handout. Unfortunately there is no contact info provided. Some we have managed to find. Recently we noticed that while we were not paying attention Carmel-by-the-Sea had become a tasting destination. Along with all the wonderful restaurants is now a solid collection of tasting rooms. Because we hate to miss out, we decided to go visit some and experience for ourselves what they had to offer. One Tuesday afternoon some circumstances came along that had us in the Carmel-by-the-Sea area. With an hour or so to spare we decided to have a quick glass somewhere. As we started to run through the likely candidates we looked down the street and saw Vino Napoli. Having been there some time ago and enjoyed it, we decided we should just quit wasting time and go in and see if anything had changed (for better or worse). The good news is not much has changed. It was a very nice experience. 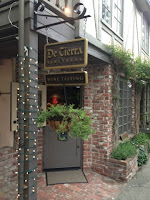 The staff were friendly and knowledgeable and the wines were good as well. You thought we were just going into have a glass. Well as it turned out the staff swayed our decision towards a tasting flight of Italian reds. A flight of half pours of lovely Italian reds that really hit the spot. We would have loved to have spent more time there and enjoy their offerings of appetizers and a little more wine, but duty called and we were off. 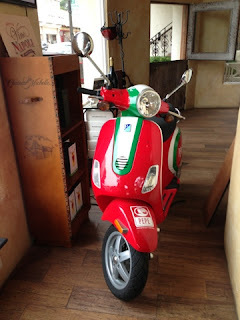 But just so you know we will be planning a return visit to hang out and enjoy more of what Little Napoli has to offer. Located on the corner of Dolores St. & 7th St. and open from 3pm- 10pm (look for the five Italian flags) and oh by the way, there are no street numbers in Carmel, but in those famous words we heard so often in Italy, "you can't miss it". 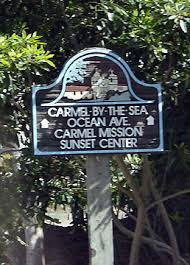 After our quick visit we were keen to go back and explore some more of Carmel-by-the-Sea. So one Friday night we were head back for dinner and some drinks. First up was the De Terra Tasting Room located on Mission and 5th. Kind of a combination wine bar and tasting room. We settled into some comfy chairs by the window, where we could keep a eye on the goings on inside (a cosy, lively atmosphere), and also watch the world walk by on the outside. A staff member was quick to welcome us and tell us about the offerings that evening. We chose the Friday night flight, after all, it was Friday night. What a good choice that was, as all the wines were good and the pours were of a very nice size and the price was basically a tasting fee. The place was busy but not overly packed and everyone seemed to be enjoying their wine and the place. What a great spot for some wine and hanging out. 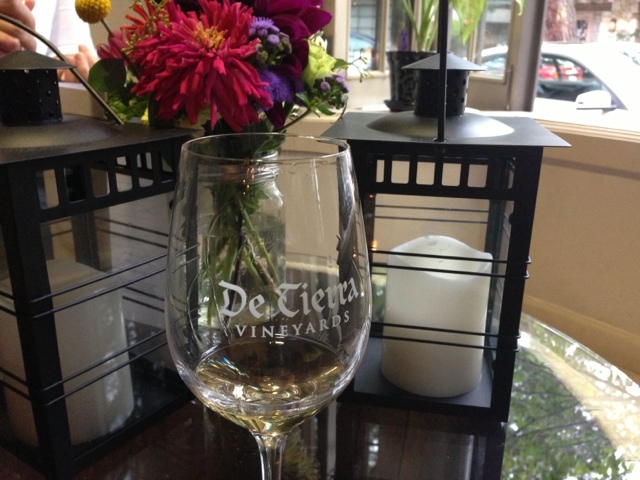 The tasting room is open Tues.-Thu. 2-8 p.m and Fri.- Sun. 11-8 p.m so go go by and say g'day. While enjoying a refreshing beverage or two at these local tasting rooms we heard about what has to be the most flexible user friendly good value Passport known to man (or woman) on the planet! 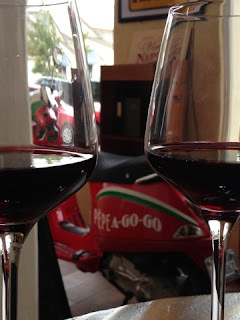 Ok maybe a bit of a stretch but this is a very well put together passport that anyone who likes a taste or two and is visiting Carmel by the Sea needs to have. Yeah we said it, you NEED to get this. The Carmel Wine Walk by-the-Sea is a Wine Tasting Passport, that for $65 entitles the buyer to one $10 flight at nine of the twelve tasting rooms who are part of this experience (a $90 value). Reaching into the wine fridge for a bottle to have with dinner the other night and what would be pulled out? A Pinot Noir from Wrath Vineyards from the River Road Wine Trail in Monterey County. Wrath makes a number of Pinot Noir wines, this particular one is their 2011 Ex Anima. This one is the lowest cost Pinot Noir they are currently pouring, but don't let that lead you to believe that it's one not to take seriously. This is a very nice drinking wine. Ex Anima, or “from the soul” in Latin, is a series of wines from Wrath that feature minimal wine making intervention and no new oak. These wines present individualistic expressions of the maritime climate and gravelly soils from the estate vineyards. The grapes for this wine come from the award winning San Saba Estate Vineyard, which is set in a sheltered nook just below the Santa Lucia Highlands AVA. 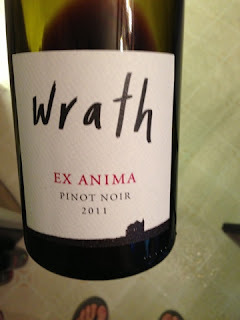 The 2011 Ex Anima is pinot for those that love Pinot Noir. It features Clone 828 harvested at moderate sugars and aged in a combination of stainless steel and neutral oak barrels to emphasize the fruit character of the grapes. The bouquet is bright, berry-like and generous. The palate is a silky mix of strawberries, cranberries and blueberries. This was a very good WW wine that was fabulous with with the BBQ spicy pork chops, broccolini and Au Gratin potatoes. This wine hits higher than its price point at 6+ and only a couple dollars outside **** it is an easy go to choice to go with any night dinner. Swing on by the tasting room and get some for yourself and tell em we sent you! Carmel by the Sea Wine Tasting and other discoveries. Some thoughts on our observations from a recent visit to Carmel by the Sea. Who knew there were so many places to grab a taste. When did this happen? 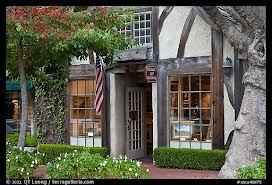 Visiting Carmel is for dinner at one of the many fine restaurants, and wandering the streets holding hands (not with each other) looking at all the neat shops and galleries. Tasting rooms? We knew there were some but had very little idea of the number that exist now. Where do we begin? Carmel by the Sea has so many good restaurants and cafe's, and over the last few years the number of good places to have a taste has grow rapidly. The area is now a definite tasting destination with over a dozen places to taste. There is a tasting Passport that is by far the best way to do that available from the Tourist Information Center. 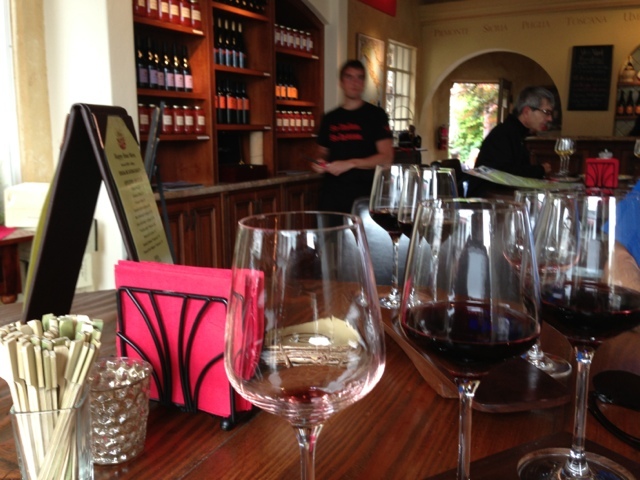 The Carmel Wine Walk by-the-Sea. The area also has many choices of accommodation from simple to Luxury Hotels to B&B's, there is a choice to suit almost anyone's needs or desires. With the town being quite small you can walk everywhere. Window shopping is the sport of choice as there are many wonderful art galleries and boutiques. Although, if you are looking for the just right piece to go over the armoire, you can find it here. 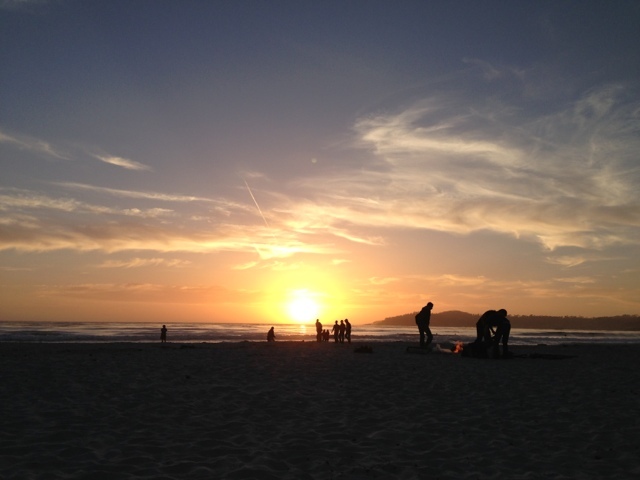 If you’re after a romantic getaway to a quaint seaside, art-filled village, Carmel might be perfect for you. You can even bring your dog, as Carmel’s hotels, restaurants and galleries are remarkably four legged friend friendly. 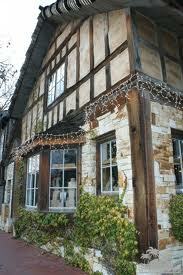 There are few places as quaint and picturesque as Carmel by the Sea in California. Situated on Carmel Bay, nestled in a pine forest above a beautiful white sandy beach, the one square mile village of Carmel offers endless epicurean opportunities and romantic charm. Carmel is the perfect base for activities and adventures, you'll have a wonderful time no matter what you choose to do in Carmel by the Sea. Never too hot or too cold it's a great place to visit at any time of year. The area is also a popular place for Destination Weddings which again just speaks to the romance of this magical place. Carmel, is a quaint and charming little town that attracts visitors year-round who are looking for romantic bed-and-breakfast lodging, fantastic cuisine, fine art, quaint boutiques, a white sandy beach, and now more than ever, world class wine, wine and more wine! With so much to check out we think some more in depth stories of some of the restaurants, accommodations, tasting places and some great events is a must, so stay tuned!